Understanding how the exquisitely sensitive hair cells (receptors) within the inner ear balance (vestibular) organs work is a major focus. Vestibular hair cells have a structure and relationship with nerve fibres that's unique in the nervous system, which is what makes them so exciting to study. I am also interested in how the hair cells communicate with the brain and how the brain communicates with these hair cells to regulate balance function. All these problems are hard to study because the inner ear balance system are located deep within the skull and difficult to access. As we age, not only is hearing impaired, but so is the balance system. My work also aims to improve our knowledge about exactly how age affects the inner ear balance system and how we may be able to minimise the effects of ageing. Since we know the inner ear balance system is able to adapt to injury or disease, another aspect of my work is to understand these capabilities and encourage them. The sense of balance is commonly overlooked. But ask anyone who has had a dizzy attack or felt unsteady on their feet and you immediately realise how much we depend on the normal working of this sensitive and responsive system. The fact we know so little about the balance system is the reason I find it so incredibly compelling to study. How does it work so well behind the scenes, without us barely knowing of it existence? Ultimately, I would like to understand how balance signals are generated and under what conditions they may be modified. One of the most exasperating and depressing problems for both patients and clinicians alike is the lack of any real treatment for dizziness, vertigo, and imbalance. Surveys of primary care doctors have shown that dizziness and vertigo are as prevalent as hypertension and angina, and approximately 40 per cent of the population will at some stage experience dizziness severe enough to seek medical attention. If we can help provide the key that unlocks the secrets of the mysterious balance system we would help millions of people throughout the world. Professor Alan Brichta is leader of the HMRI Brain and Mental Health research program and has been a prominent researcher in Newcastle since moving here from The University of Chicago in 1998. 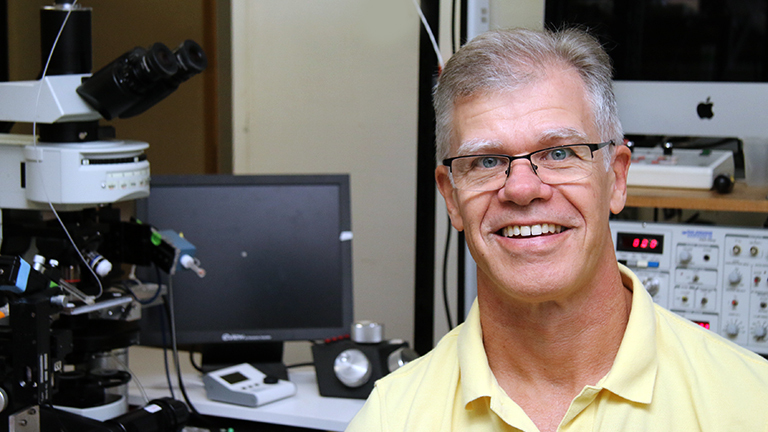 Professor Brichta’s research is focused on how the balance or vestibular system functions. The inner ear contains balance organs that comprise thousands of tiny hair cells able to detect head movement and generate signals that keep us balanced. The relay of this inner ear information, to and from the brain, is critical in allowing us to stay upright and keeping our eyes steady while we move about. Using novel and specialised research techniques, Professor Brichta and his laboratory have been able to create living models of the inner ear balance organs. Normally, these organs are difficult to study due their location deep within the skull and close to the brain. Using these models of the peripheral vestibular system, Professor Brichta has discovered how the tiny hairs inside our ears are able to transmit signals to the neurons that lead to the brain and ultimately control our balance. He is also able to manipulate the model experimentally to try and understand how diseases that affect the vestibular system, such as Meniere’s Disease, develop and may be treated. Promising results have shown that extremely small changes in the volume of fluid in the inner ear and also in levels of chemicals such as potassium, can lead to huge changes in the balance signals. Professor Brichta has been awarded a number of prestigious research grants and awards during his career, including an invited presentation to the Royal Society of Medicine (London) and a Garnett Passe and Rodney Williams Memorial Foundation Senior Principal Research Fellowship. He is Head of Anatomy and a major contributor to medical and biomedical sciences courses at the University of Newcastle and has served on national Grant Review Panels and the prestigious Assigners Academy for National Health and Medical Research Council, Australia’s peak medical research funding body.